This cake was seriously evil… in a very good way! It was hubby’s birthday cake, so it had to be something special. I’d been planning it for quite a while, but managed to hold my tongue and keep it a secret from him – trust me, that was the hardest part of making it! My husband’s not a fussy man, so when it comes to cakes he’s easily pleased! 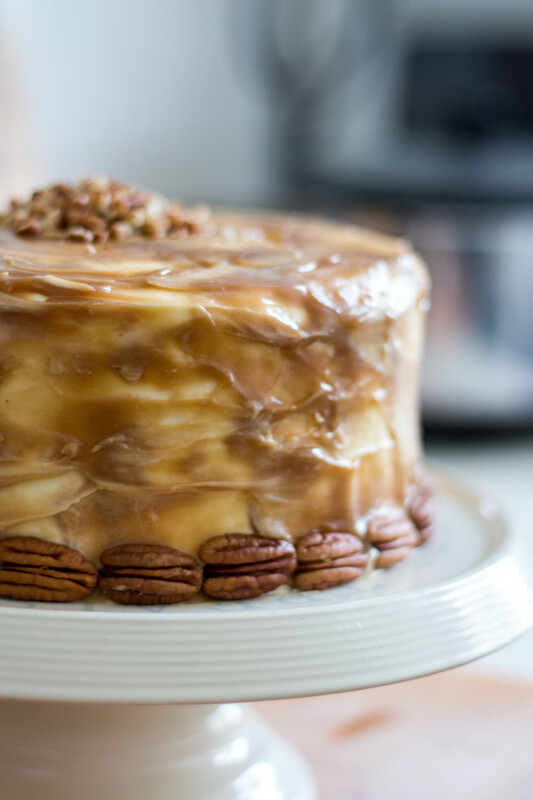 He does have a slightly softer spot for caramel though, so last year I made him a caramel cake that was OK, but nothing special. 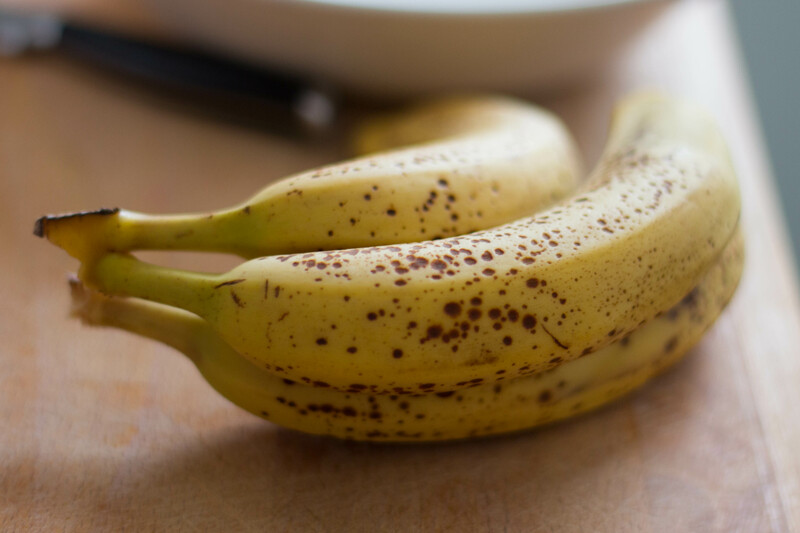 Since then, we’ve discovered banoffee pie… caramel, cream, banana… what a combo! So it was pretty clear what sort of cake I had to make. And it didn’t disappoint! Hubby loved it, guests loved it… I loved it! 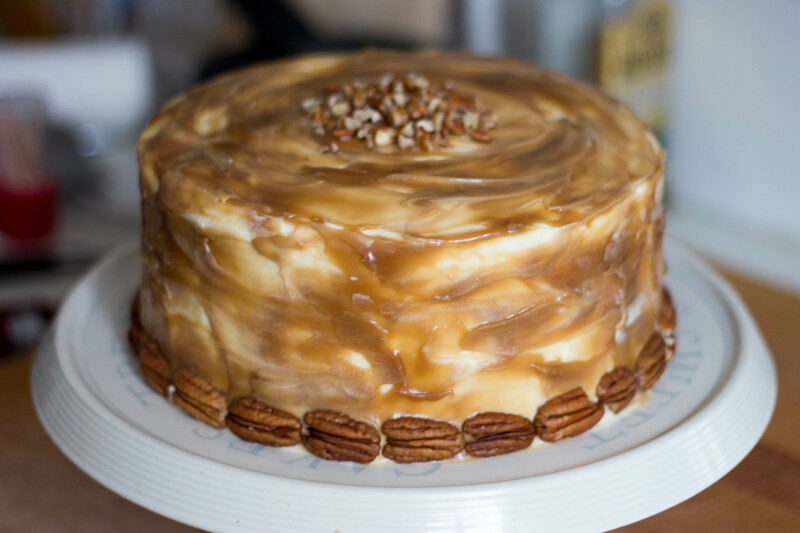 A moist banana cake with layers of salted caramel and cream, smothered in a whipped cream and cream cheese frosting, salted caramel sauce and topped with crushed pecans. Preheat oven to 180°C/350° F/Gas Mark 4, and line an 8″ (20 cm) cake tin with baking paper. Cream butter and sugar together until pale and creamy, then add the eggs one at a time, beating well after each addition. 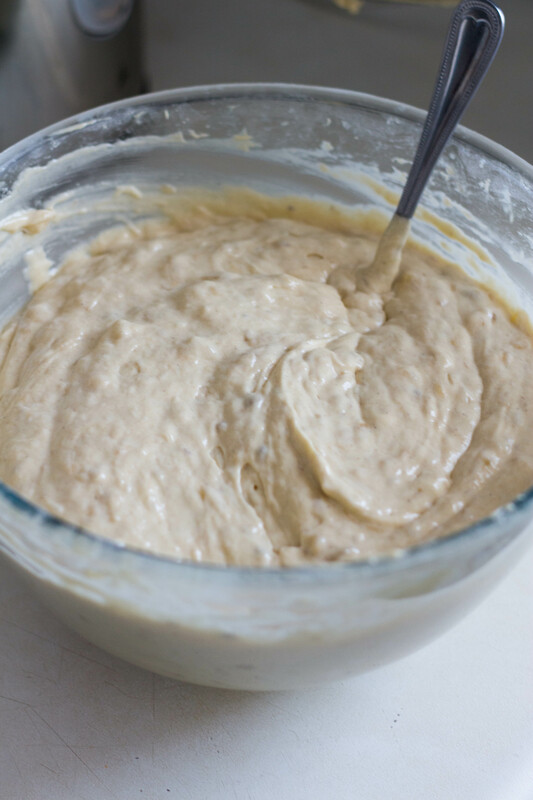 In a separate bowl, add the flour, salt, and baking powder and stir to combine. 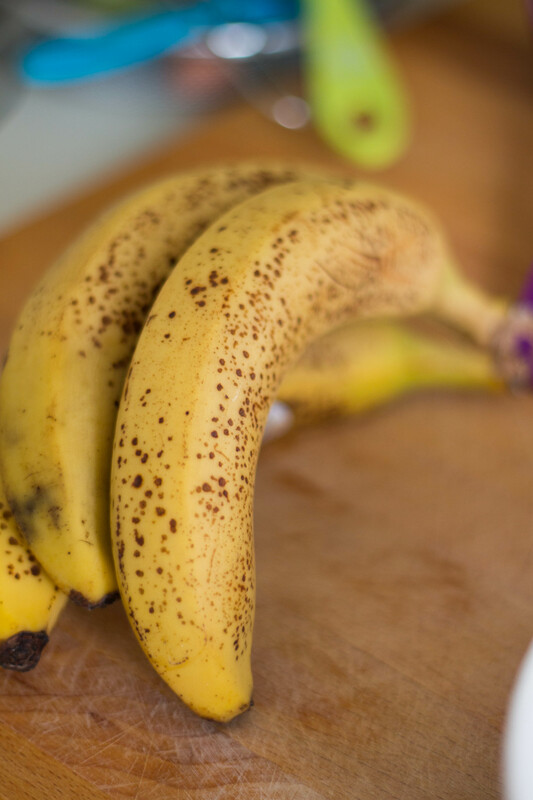 Mash the bananas, then stir in the vanilla bean paste and baking soda and set aside. 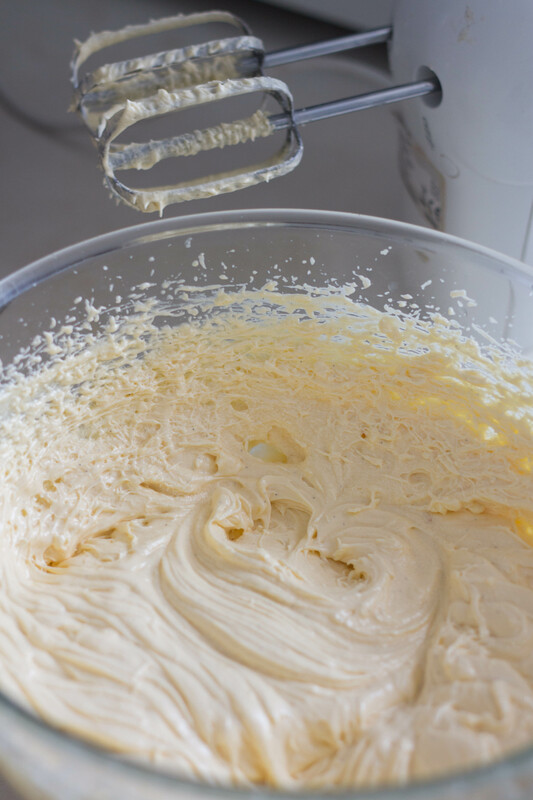 Add the flour mixture to the creamed mixture in three parts, beating well between each addition, and alternating with the cream so that you start and finish with the dry mixture. Add the mashed bananas, stirring through until just combined. Measure out four even layers (use a scale if you have one!) and bake each layer for 30 minutes. Gently melt the butter and sugar in a saucepan over medium heat. Once bubbling, remove from heat and stir in the double cream and salt. Place back on heat and stir continuously, allowing mixture to bubble up for a few minutes. Remove from heat and pour into a bowl ready to refrigerate. 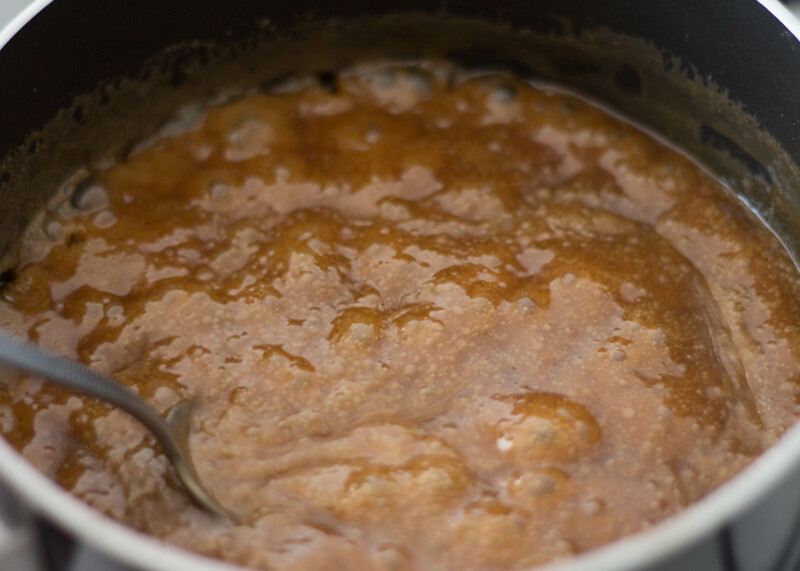 You will initially have quite a dark, runny caramel, but as it cools it will begin to thicken. 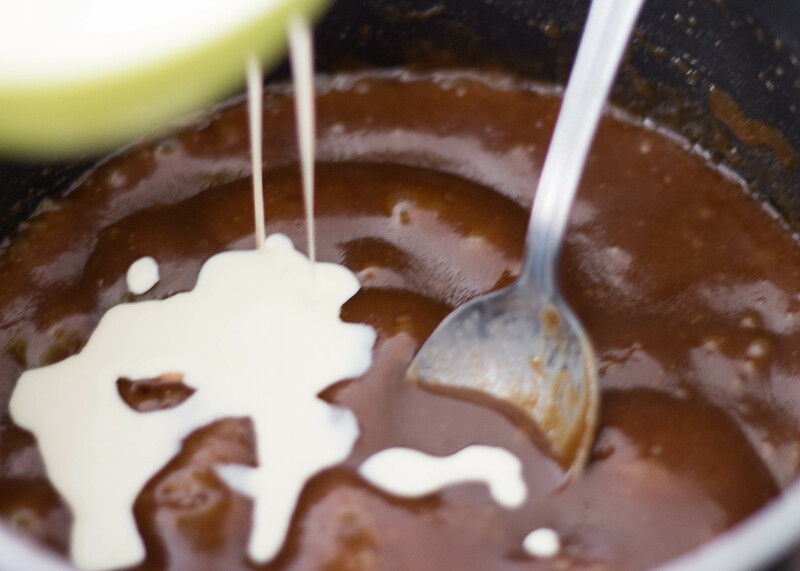 Stir your caramel every ten minutes or so as it cools. 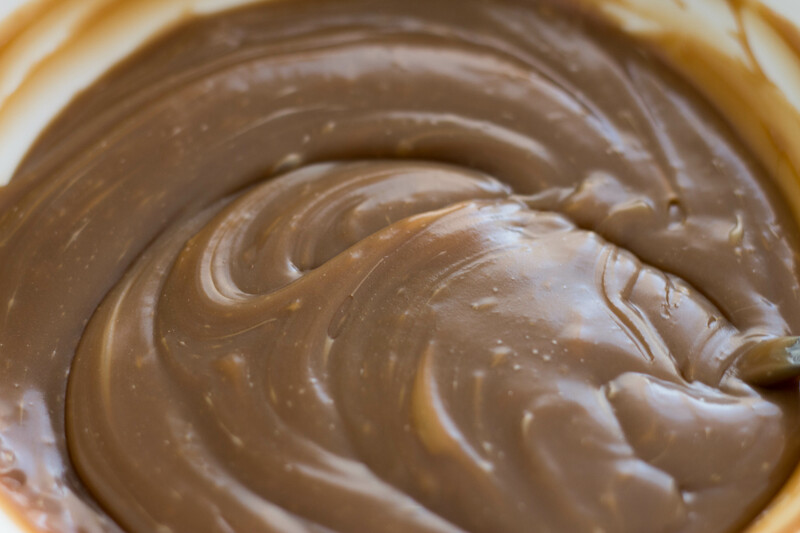 You will be left with a lovely thick, pale gold caramel – delicious! Just try not to eat it all before you build your cake! 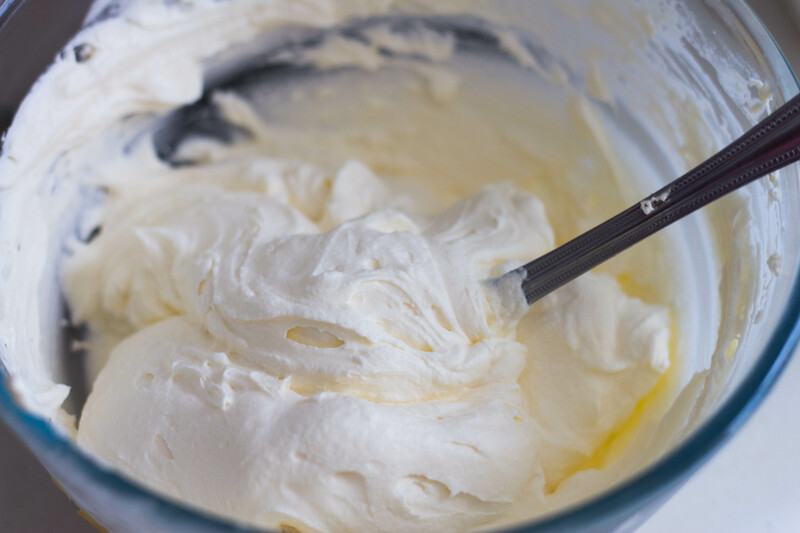 Whip your cream until it begins to thicken, then add in 1/2 cup icing sugar. Continue to whip just until soft peaks form – careful not to over beat! 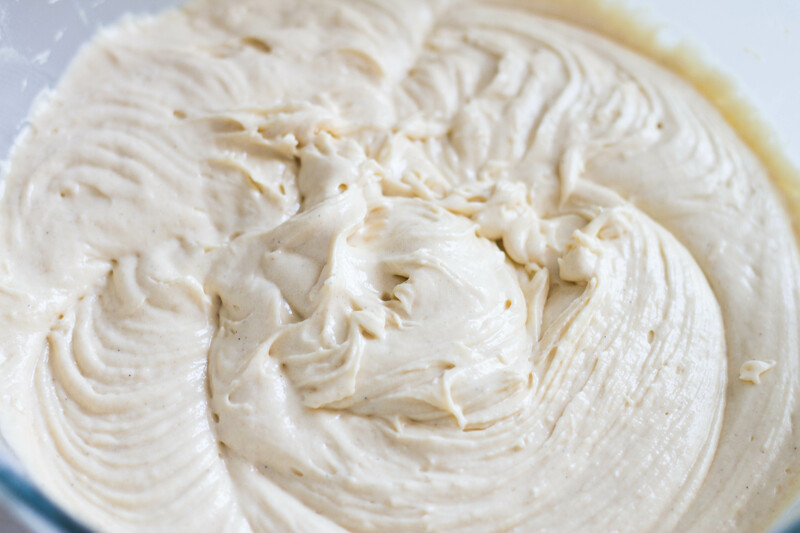 Beat the cream cheese until smooth, then add in 1/4 cup of icing sugar and beat until combined. Gently fold the two mixtures together. Use a cake cutting wire to level your cake layers. 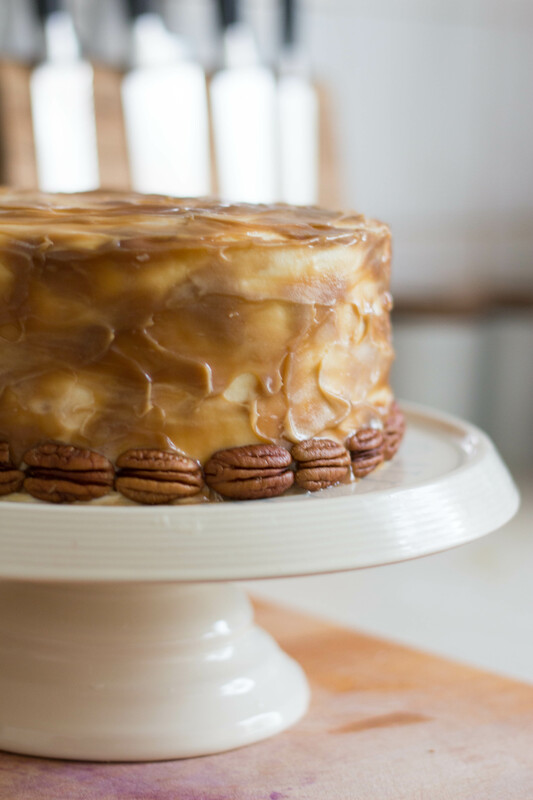 Spread a generous layer of caramel over one side of each layer, then place your first layer caramel side up in the centre of your cake stand. 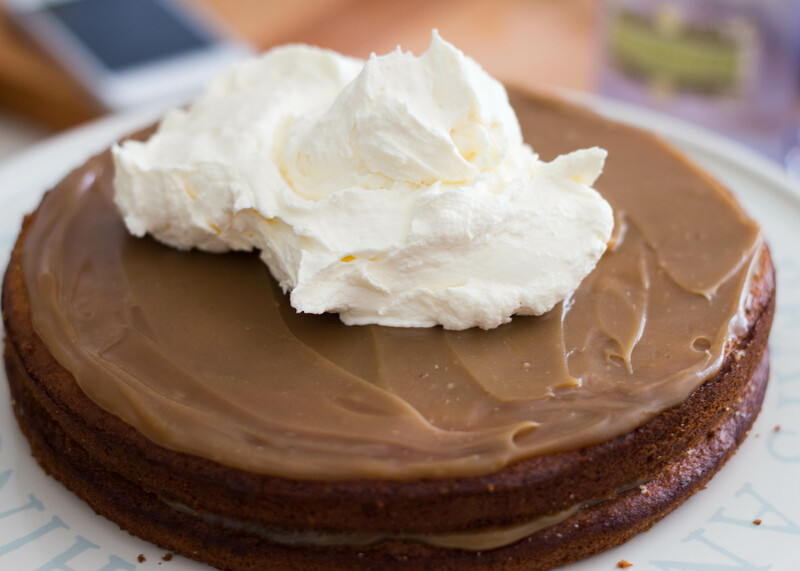 Place another layer on top of your cake caramel side up so that there is a layer of caramel sandwiched between the two cake layers, then spread a large spoon of the cream mixture over the top caramel layer. Sandwich the remaining two layers together as above, then flip the cake over so that it is caramel side down and gently place on top of your cream layer. 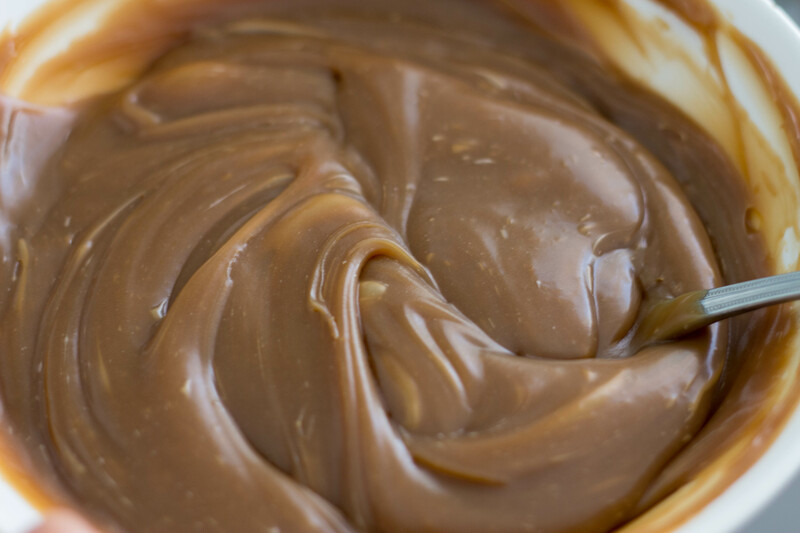 You will get caramel on your fingers, but don’t worry, you can lick it off! 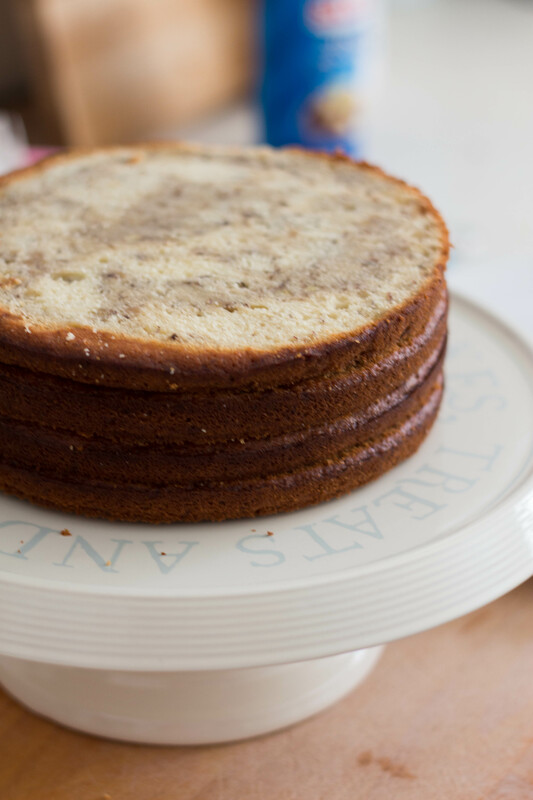 Crumb coat your cake with the cream mixture, then place in the fridge for 20 – 30 minutes. 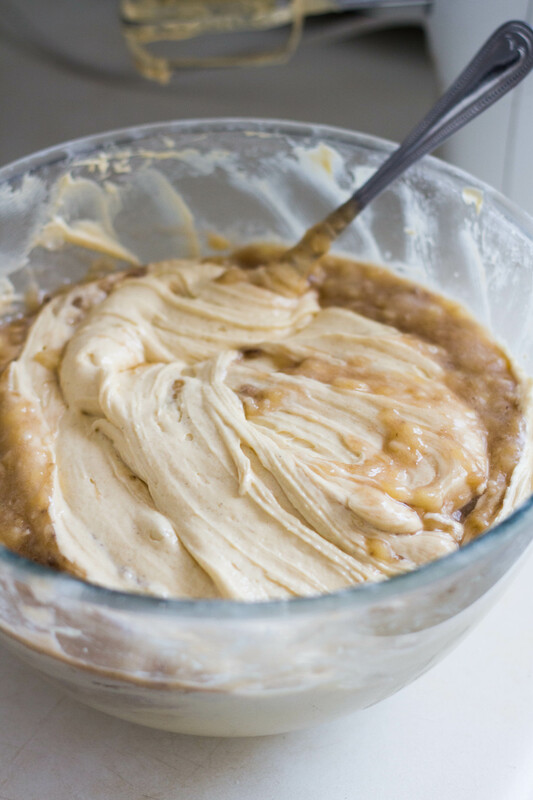 Use the remaining cream mixture to cover your cake in a thick layer, smoothing it out like frosting with a palette knife . 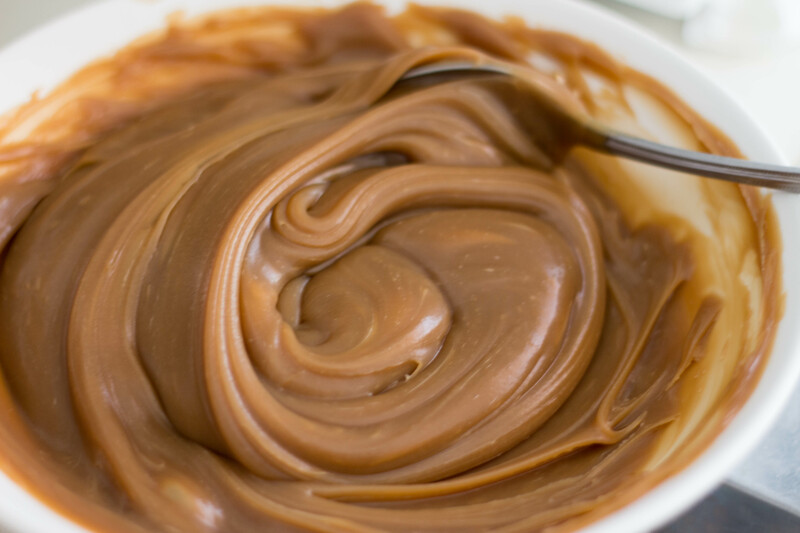 Clean off your palette knife, then take a small amount of caramel and, in gentle strokes, smooth it over your cream layer. 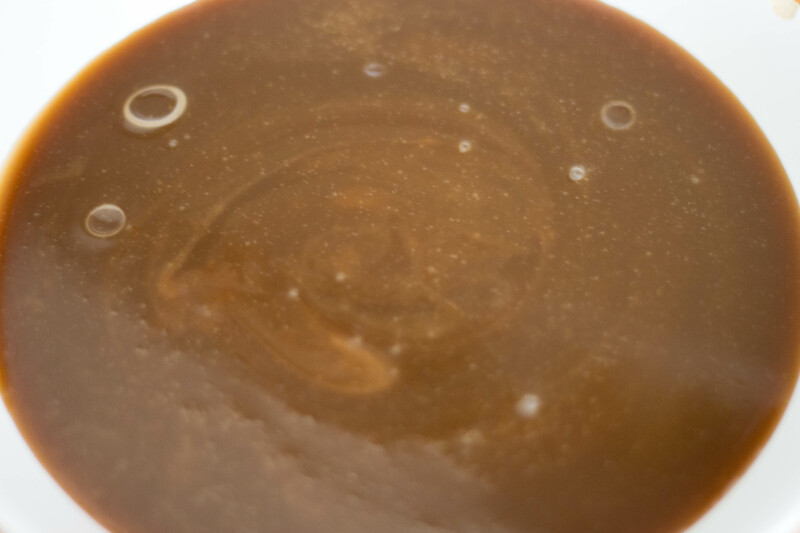 I found it easier to take lots of very small amounts of caramel, rather than trying to smooth large amounts out over the cream – you don’t want to blend the caramel and cream completely! 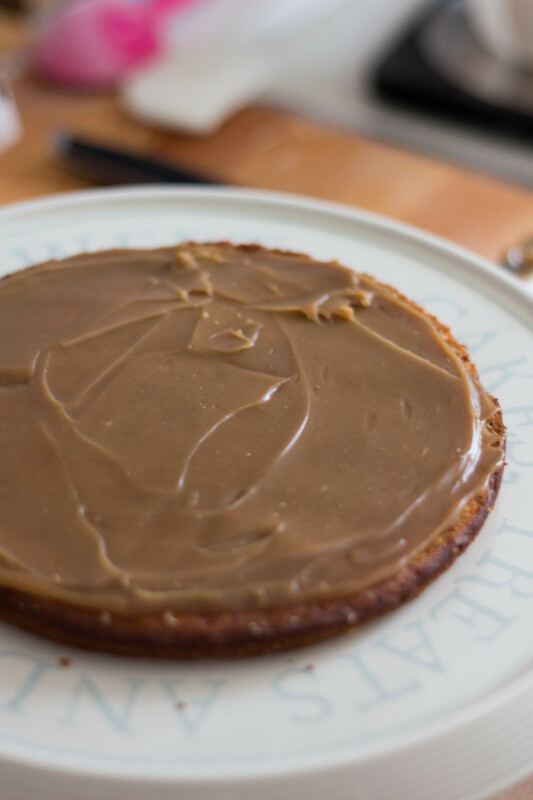 Tip: You want the caramel quite thick when spreading over your cake layers to prevent it from running down the sides, so do this straight from the fridge (if it’s not too thick!). 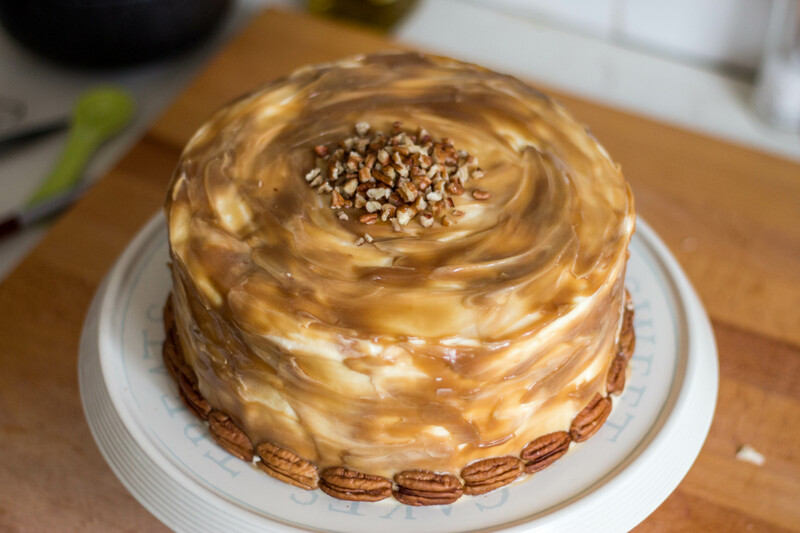 For the outer caramel layer it will be much easier to spread if it’s softer – leave the caramel at room temperature while your crumb coated cake sets in the fridge and you should have the right consistency when it’s ready. This cake looks seriously yummy! I have to try it when a special occasion comes up! That caramel looks positively decadent too 🙂 Thanks for posting! Thank you 😊 It really was (yummy and decadent)! 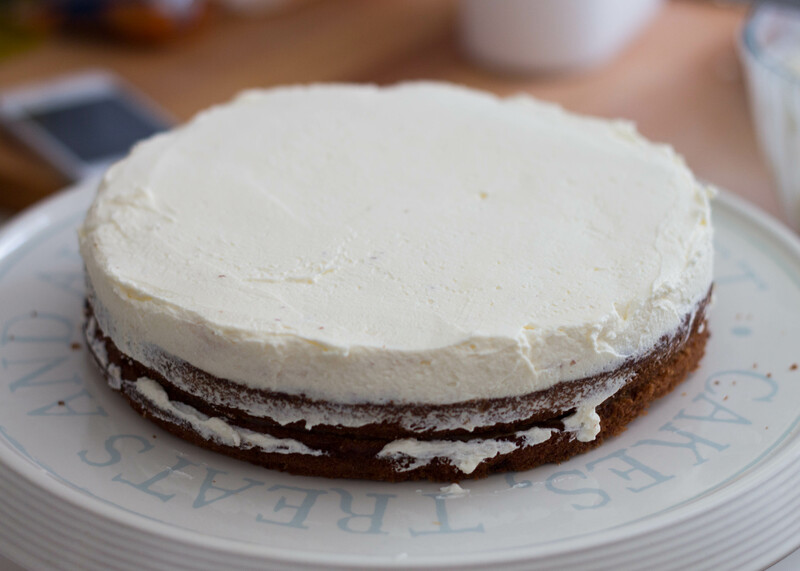 I recently made a banoffee cheesecake that was wonderfully delicious also, keep an eye out for the post! Thank you for sharing this recipe. I made your bannoffee birthday cake last week for my daughter’s 16th birthday and it went down a storm. The salted caramel flavour is exquisite – really clinches it. It was enjoyed by all. Thanks for sharing! 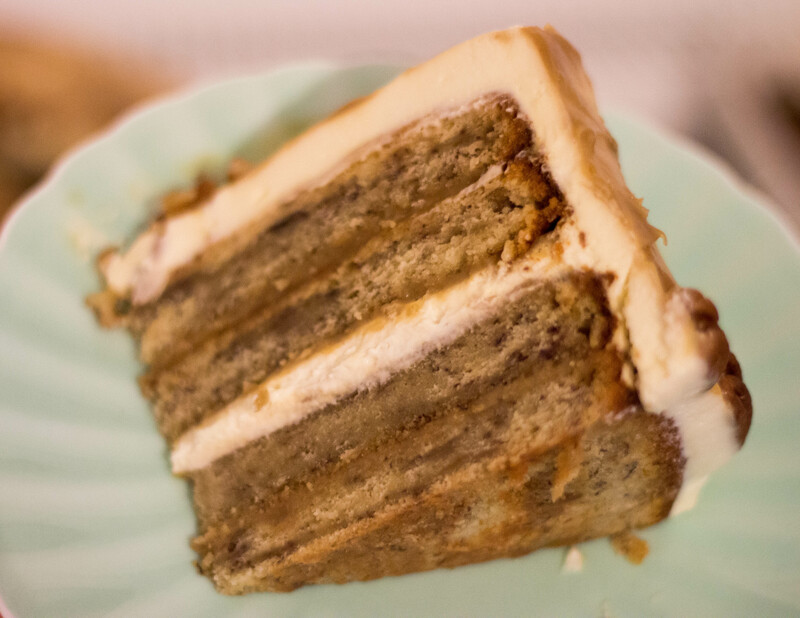 So good to hear you all enjoyed it – the salted caramel really is the ‘icing on the cake’, isn’t it. Hope your daughter had a lovely birthday! Any suggestions for toning down the sweetness of the caramel without affecting the consistency? Thanks for the question 🙂 although I don’t think there is an easy answer. 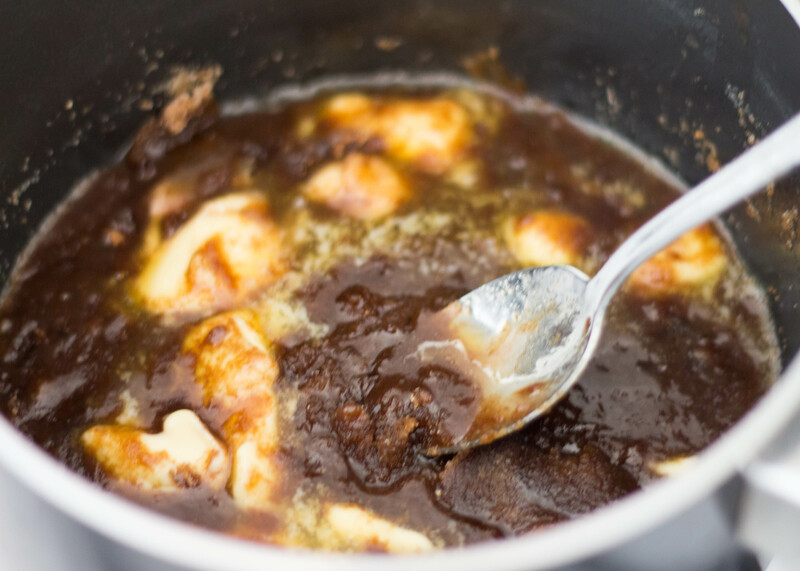 If you wanted to use less sugar the thick consistency may still be achievable by heating the caramel to a higher temperature. I don’t use a candy thermometer with this recipe as it isn’t necessary, but it is certainly something that could be experimented with. The other alternative would be to add some sort of dried fruit instead of all the sugar. 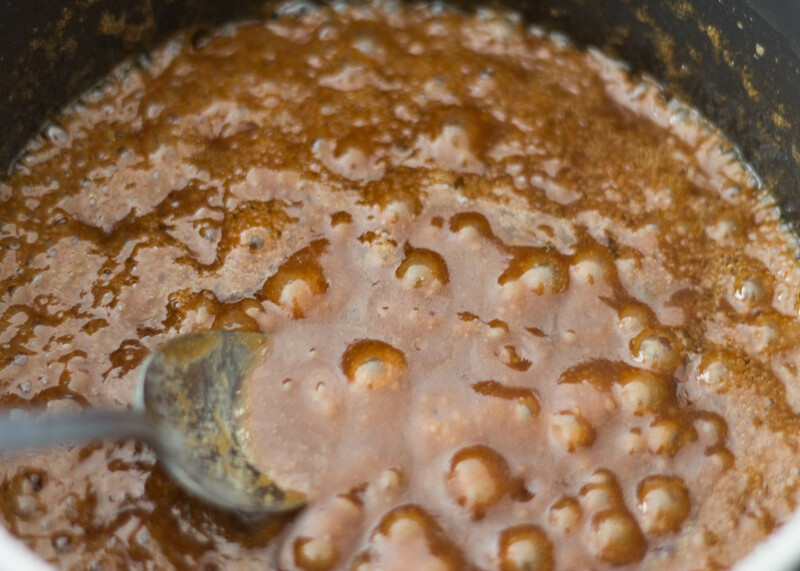 I made a delicious caramel-like sauce recently that used puréed figs. Try cutting down the amount of sugar for the caramel and substituting it for some figs. 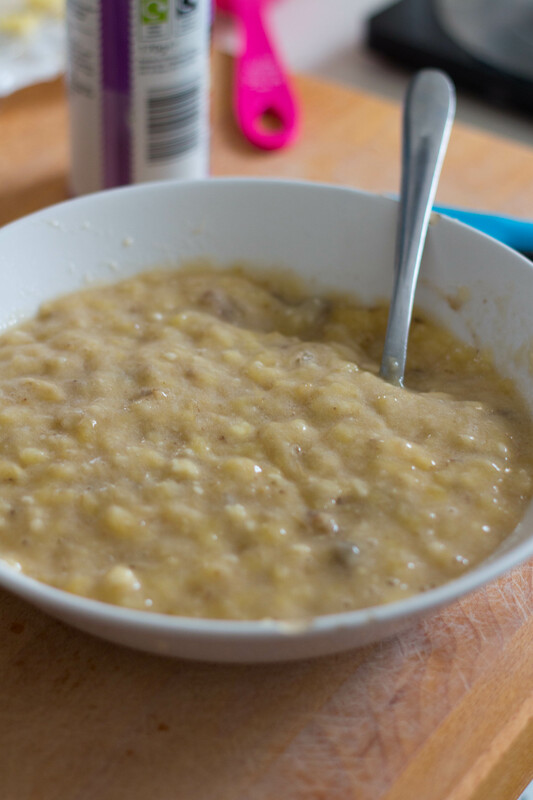 I can’t give you exact quantities as I haven’t tried it, but I would suggest stewing some figs with a bit of water until soft, then purée the mixture in a food processor. Make the caramel as in the recipe, leaving out perhaps a third of the sugar. Add the figs in at the end and then leave to cool. The consistency does change as it cools, so this may take a little trial and error! I might give this a go myself, but if you get to it before I do let me know how it turns out! 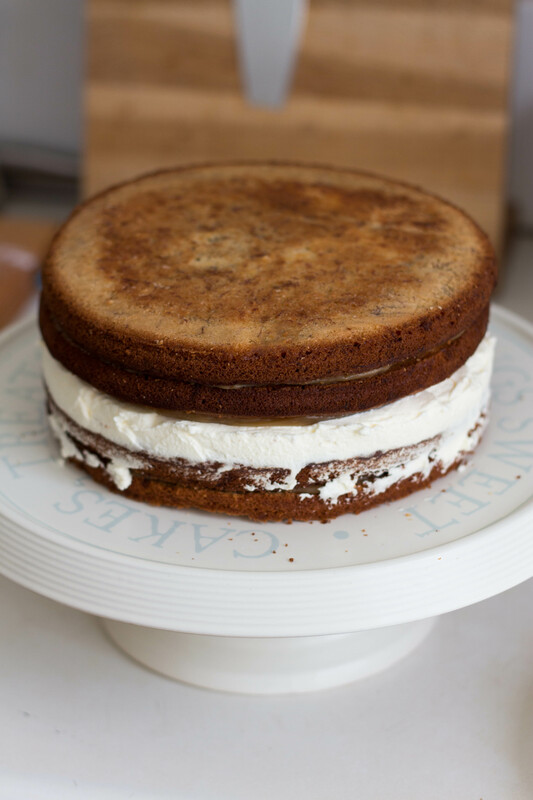 Could you please tell me with the banoffee cake you have 2 recipes in the banana sponge: single cream and vanilla bean paste. But there is no mention in the instructions how or when to use this. The cream is added to the creamed butter and sugar mixture in alternation with the dry ingredients. You are right with the vanilla bean paste though, I did leave this out of the instructions! Apologies for that, I have added it in now with the mashed banana. The vanilla bean paste can really be added at almost any point, I only wouldn’t recommended adding it to the dry ingredients! Hope that helps, and I hope you enjoy the cake! I Had my birthday biginning of this week but decided to celebrate it with family yeaterday and guess what? 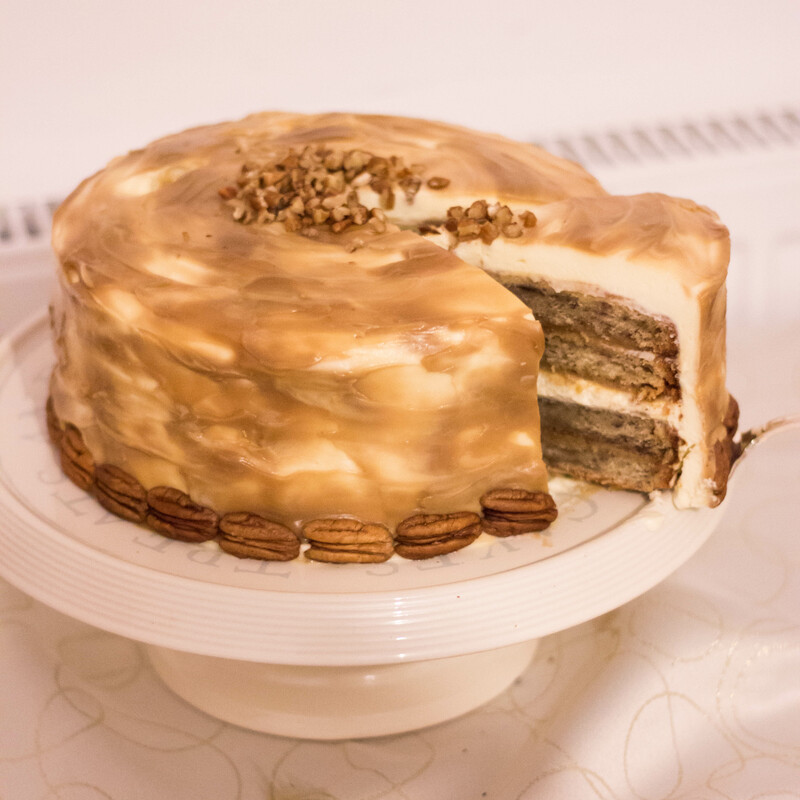 Yeaterday, my 19 years old son baked the “banoffee Birhtday Cake” and it turned out absolutely best ever cake. saltiness/sweetness was perfect. Really really delicious, divinely. This recipe will definitely goes in to my “Favorit list” and be baked many many more times. First of all, Happy Birthday for last week! I hope the celebrations were wonderful. I was so pleased to hear your feedback on the cake, and to hear that it was shared on such a special occasion. Very impressed that your son whipped it up, too – there’s really nothing better than a homemade cake from someone close to you. I am making this for my husband’s birthday while we are on vacation. Because of that, I am planning on making the parts ahead of time and assembling it there. Can I make the frosting ahead of time and keep it in the fridge? I have done this in the past with others, but I don’t have a lot of experience working with whipped cream in frosting. Will the cream cheese help to hold it together? Hi Amy, thanks for getting in touch! I think this icing is best made fresh, as it shouldn’t be over-beaten. You could make it a day or so ahead, but you will need to ensure it stays refrigerated as the cream won’t like being at room temperature too long! Hope the cake goes well, and that you have a lovely vacation! oh WOW! My favourite is Bannoffe, I so love this. Thank you for sharing.